Clarksville, TN – The man who spent “A Night With Saddam” has tossed his hat into the political ring. Dr. Mark Green, who authored the book describing the capture of Saddam Hussein and his subsequent medical care is planning to challenge State Senator Tim Barnes in the 2012 election. “I was encouraged to run by Lt Governor Ron Ramsey” said Green. “I’ve seen many opportunities missed by the incumbent, and I want to represent the district and take advantage of those opportunities” according to Green. In an exclusive interview with Clarksville Online, Doctor Green said “”The size of government and individual opportunity are inversely related. As government grows, individual opportunity plummets. We need to keep the size and cost of our state government as small as possible and out of the way of our state’s entrepreneurs and businesses.” As CEO and founder of a health care-company, Align MD, Dr. Green understands the challenges facing businesses in these difficult economic times. In prepared text he plans to deliver tonight to a private gathering of Republican leaders, Doctor Green plans to announce his plans to run for the State Senate District 22 seat held by Democratic incumbent Tim Barnes. Doctor Green’s military career began as an infantry officer. From 1987-1990 he served as a rifle platoon leader, scout platoon leader and battalion personnel officer at Fort Knox, Kentucky. He has served with the 82nd Airborne Division, is a graduate of West Point and recipient of numerous military awards, including the Meritorious Service Medal with two Oak Leaf Clusters, The Army Commendation Medal with two oak leaf Clusters, the Army Achievement Medal with three Oak Leaf Clusters, US Army Flight Surgeons Wings and more. “Today in America, and right here in Middle Tennessee, there are children growing up afraid. They are worried about the solvency of the country, about their health care expenses and they are worried about getting a job. The numbers of unemployed are staggering, and at a minimum these people have placed their dreams on hold”, said Green. “Because of this, I cannot stand idly by any longer.” “My wife, Camilla, too, has had enough” Green said. 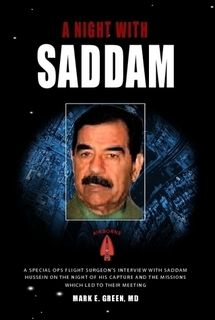 Doctor Green wrote the book “A Night With Saddam”, documenting the capture and ensuing care and interrogation of one of the most violent dictators in the world. Mark Green is the first candidate to declare his intentions for the district 22 Senate Seat. Incumbent Tim Barnes (D) has not indicated his intentions to run for re-election as of yet, but is expected to run.